I've been working with black and white photography as inspiration during my self-directed learning about contrast and scribbling portraits of people. Only recently did I discover the excellent collection of vintage photography (much of it free of copyright restriction and labelled as such) at the Flickr stream of the U.S. National Archives. Of course, the rather random photographs cataloged there do not have the artistry of a photograph by Molly Malone Cook or Vivian Maier, but they do have their own sort of charm. I had a chunk of time the other day, and after lots of practice lately with the brush pen and big chunky lines and broad areas of black and white, I wanted to do a slow, fine-lined portrait of someone. It felt like a nice change for a sunny, lazy afternoon. I floated through dozens of possible resource photos until one completely captured my imagination. 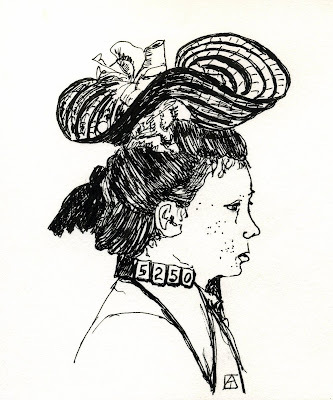 This is my drawing of a mugshot of Lizzie Cardish who in 1906, at the age of 15, was sent to Leavenworth to serve a life sentence for arson. This was later commuted to confinement until the age of 21. What struck me about this photograph? I mean, the Flickr stream holds loads of interesting images to work with. Well, I just couldn't get past the hat, with its complicated straw wave and the many-folded bow on top of her head juxtaposed to the criminal identification number resting across the tender and vulnerable part of her neck. Fifteen years old. Sent to prison for life. I've mentioned earlier how juxtapostion--the placing of two unrelated things near each other--fascinates me. I always appreciate it in poetry, fiction, film. Now I'm learning to appreciate it in visual images. I just love the energy and tension that vibrates in the gap between the two things. That gap seems the sort of swirling chaos where new, interesting ideas and understandings can arise. I'm curious about using it as a new perspective to take on life as well as art. I'm not sure how long I'll stick with mostly black and white drawings. I miss my watercolors! Maybe I'll try to carry some of my new thoughts about contrast and juxtapostion back into my colored sketches. But this recent interlude of studying high contrast scribbling has certainly been fun.